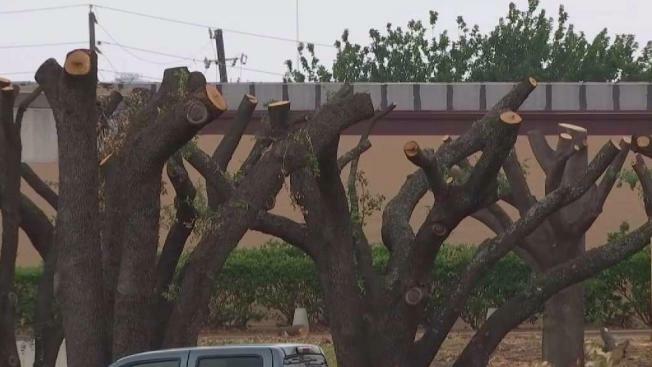 Workers spent the day Friday grinding up branches of what were 75 large live oak trees outside a Northwest Dallas office building. Aerial photos of the site taken earlier show dense green foliage that surrounded the building in front of a Home Depot store in the 2800 block of Forest Lane near Interstate 635 LBJ Freeway. "That's one of the beautiful things about this area, is those trees when you come into the Home Depot parking lot," said neighbor Rick Sanders. "Those are just beautiful, magnificent trees." Neighbors are sad and upset about the drastic change in the appearance of those trees over the past few days. It looks like a tornado stripped all the foliage, but it was no act of nature. It was intentional work arranged by the property owner. Neighbor Justin Huse spoke with the owner. "And the issue was, according to them, people would not be able to see the property because of the trees. And so this was their solution to it," Huse said. "Anybody who knows anything about trees knows they could have pruned them from the bottom up. Keep the canopy and they would have been able to see the property just fine." Huse first learned about the work on a neighborhood website. He stopped to see for himself and recorded a Facebook video for others to see. "It is very heartbreaking and it makes me very angry," he said. "They were a tad overgrown. They could have used a little pruning, a little TLC, but they looked beautiful." Arborist Steve Houser said topping a tree of all the foliage causes serious harm because the tree needs leaves to create food for itself. "It's affected the structural integrity and the health of those trees, and it would be considered by our industry to be 'irreparable damage,' without a doubt," Houser said. Houser serves on the Dallas Forest Advisory Committee. He knows the city of Dallas tree ordinance. He said property owners could be allowed to remove live oak trees, but the trees must either be replaced with the same size trees on site or pay money to a tree replacement fund. Houser said the fee is $100 per inch of trunk diameter measured four-and-a-half feet off the ground. This building owner could be forced to pay that plus an additional fine for destroying the trees. "Trees clean your air, your water and your soil. They add greatly to your health, your sense of wellbeing, the quality of your life if you live in that area," Houser said. On Friday a man who said he represents the property owner asked an NBC 5 photographer to leave the property. The man said the city of Dallas approved the work. "The city would not approve cutting trees like that," said city of Dallas spokesman Richard Hill. Hill confirmed a city arborist has started an assessment of damage to the trees which should be completed next week. A citation could be issued to the owner. Neighbor Justin Huse said there are too few trees in the area. "This is murder," he said. "It looks like a war zone."